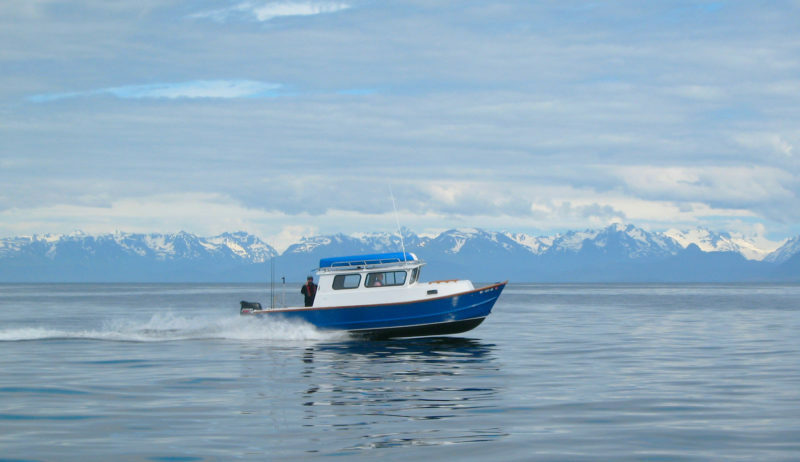 One of the better-known trailerable boats in Southcentral Alaska is the Tolman skiff. Designed by the late Renn Tolman of Homer, Alaska, in the early 1990s, the three models of the skiff have become a common sight in Alaskan waters. The beautiful power-dory-inspired lines and stitch-and-glue construction made the design very popular for new builders. Even those with little or no woodworking skills can take on these easy-to-build boats. Renn’s book, Tolman Alaskan Skiffs, details three models: the Standard, a 20′ open skiff; the Widebody, a 21′ 4″ version of the Standard with a console, a cuddy cabin, or a pilothouse; and the 22′ Jumbo, a cruiser that can support a full cabin with pilothouse. 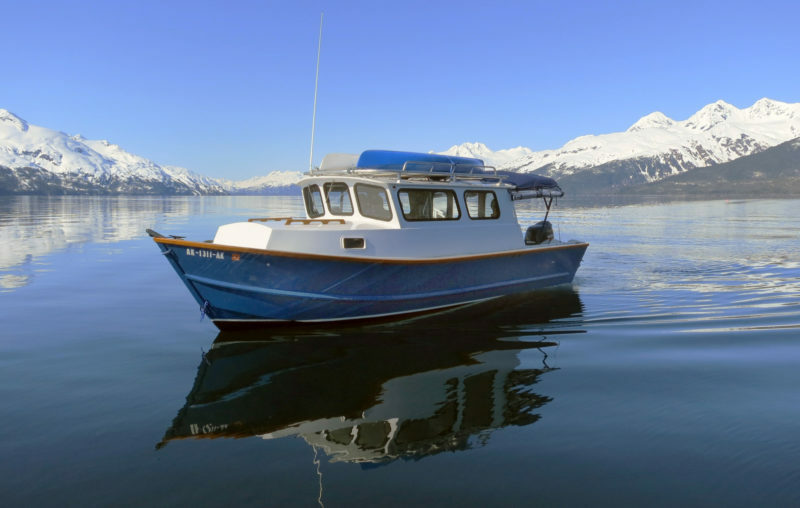 In recent years, the Jumbo, stretched by many builders to 24′, with its comfortable overnight accommodations, has been the most popular of the three Tolmans because of its usefulness in Alaskan coastal waters. Although the skiffs were designed for that area and the Pacific Northwest, they have been built and used from the California coast to the Florida flats and other parts of the world. The plans for the Jumbo and the two other models are in Tolman Alaskan Skiffs. The book has no shortage of drawings and pictures to build by; it’s also an enjoyable and interesting book for those who have been contemplating building their own boat and need bit of inspiration and encouragement. The author takes the intimidation out of getting started by eliminating the lofting and supplying all of the measured drawings required, including those for the bottom, sides, shelves, and transom with options for the transom depending on the motor chosen. At this stage of the construction, the bottom panels have been assembled, including the second layers of 1/4” plywood at the bow and the chine flats. The 4” chine flat at the left is clearly visible at the edge of the bottom panel. The first side panel has been installed with the help of screws and fender washers. 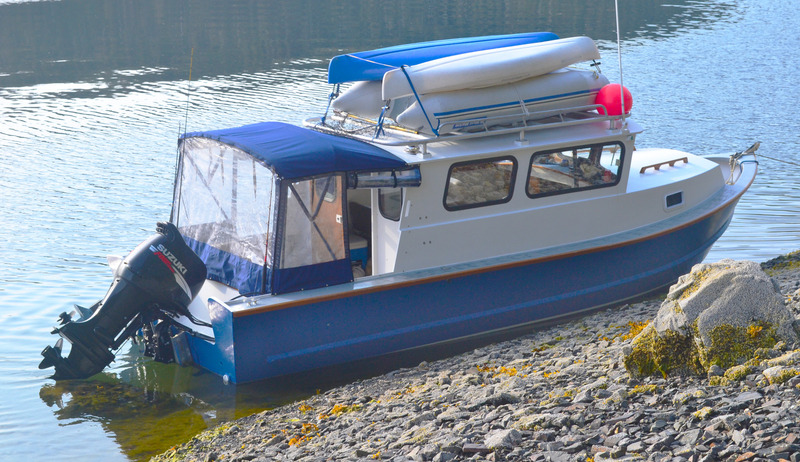 The hull is built with standard marine or okoume plywood, and the step-by-step instructions make it easy to scarf the plywood sheets together for the bottom and side panels. By stacking the plywood in stair-step fashion, all scarfs are cut at once using a hand planer and a belt sander. Once smoothed, the scarfs joints are aligned and epoxied together to form the long panels. Each bottom panel starts with one length of 1/4″ plywood forward and two lengths of 1/2″ plywood aft. The 1/4″ plywood offers easier bending at the bow. The interior faces are flush with each other; the exterior surface temporarily leaves half of the bevel on the 1/2″ plywood exposed. The two full-length bottom panels are then stitched together and mounted on forms at the proper deadrise. With an outboard of 115-150 hp for power, a Jumbo can fly along at up to 35 knots. The bottom has narrow chine flats. One of the well-thought-out features of the Jumbo design, they provide lift at speed and keep the spray down. The flats are stitched and glued in place and then the bottom panels are taped, fiberglassed, and epoxied on the interior side. The bottom assembly is then set aside while the other components are completed. Two 2” x 14” longitudinal stringers are cut from laminated veneer lumber (LVL) beams, the kind used in residential construction; they provide great strength to the hull and support the cockpit sole. LVL beams are easier to cut and stronger than dimensional lumber that was used in earlier Tolmans. Next, the transom, stringers, shelves, and stem are secured upside down on the building frame, followed by epoxying the previously assembled bottom panels to them. 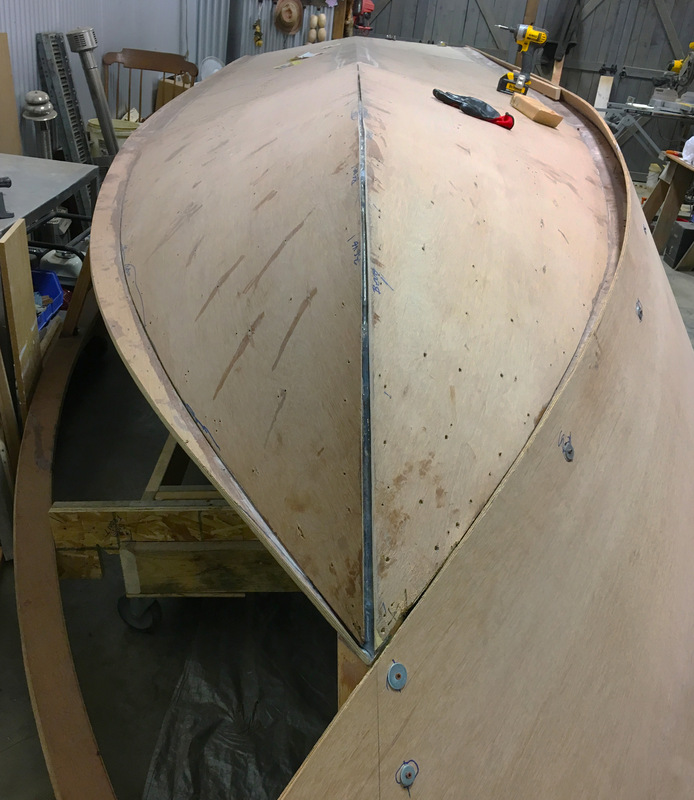 Now is when a second layer of 1/4″ plywood is applied to the bent 1/4″ plywood portions of the bottom panels, bringing the forward end of the hull to a 1/2″ thickness. The entire hull is then covered with fiberglass cloth and epoxied. Spray rails are added to the side panels and a durable UHMW polyethylene shoe is installed to protect the keel . At this point, the hull can be removed from the building frame, turned over, and the installation of the selected cabin option can begin. The Jumbo can sleep up to three adults comfortably. Many builders depart from the cabin arrangements provided to meet their individual requirements. 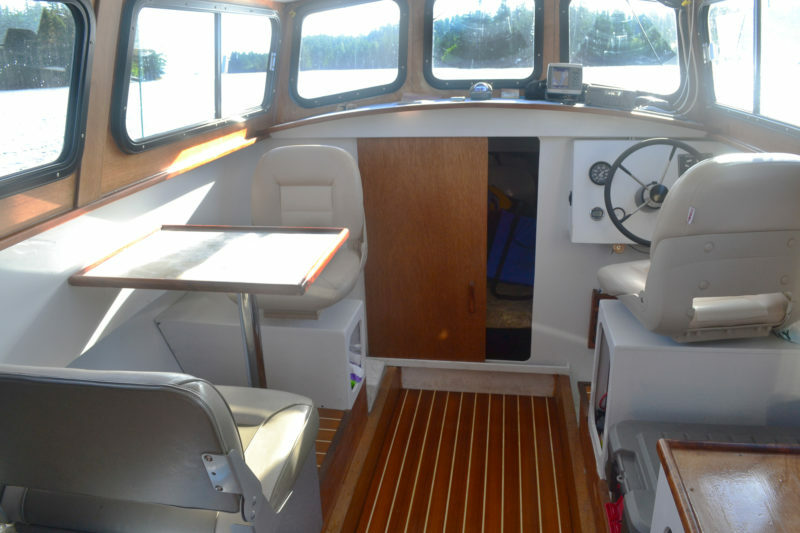 While the book includes detailed instructions for building optional accommodations such as a cuddy cabin with bunks, a wheelhouse, steering stations, cabins, and various seating arrangements, many builders design their own. Measurements are given for placement of the bulkheads to obtain the best balance and usefulness depending on cabin and deck configuration. The instructions offer suggestions for the placement of the gas tank, storage lockers, and anchor well. Everything the novice builder needs to know is in the book. Material lists, tips for working with fiberglass cloth and epoxy, setting up shop, and tool selection are all covered. The hull can be built in about three months, but adding a cabin and other features will make it a longer project. A Jumbo with the full cabin will sleep two or three adults and makes an excellent craft for weekend or even weeklong adventures. I built my Jumbo ten years ago to take advantage of more deck and living space than the Widebody I’d built a few years earlier could provide. With 8’ between front and rear bulkheads and 6′ of deck space, there is always plenty of room for fishing and room inside when the weather isn’t at its finest. Most builders power the Jumbo with a single four-stroke outboard in the 115–150-hp range, which allows it obtain speeds up to 35 knots. I chose a Suzuki 140-hp four-stroke, which made for a very well-balanced and quiet ride, and a 9.9-hp high-thrust auxiliary motor. The Suzuki has never left me stranded, but the 9.9, which pushes the boat at about 5 knots in calm water, could get me home if it did. The Jumbo’s transom is strong enough and wide enough to take two powerful outboards, providing more security, though many have a main outboard and a trolling motor. The transom is stout enough to handle twin motors for those who want that extra security. Fuel economy is outstanding and ranges from 3 to 5 miles per gallon, depending on load and motor choice. This allows adventurers to reach those places that may be a stretch for a larger boat that consumes much more fuel. Using Renn’s recommended placement of the gas tank under the rear deck, my Jumbo has a range of 250 miles or more. Driving the Jumbo is always a pleasure. Although this boat feels well balanced and performs well on calm seas, it is also right at home in a 3’ or 4’ chop. There will be little pounding in choppy water, which is to be expected with such a light boat. The hull has a 12-degree deadrise at the transom, increasing toward the bow, which gives it a comfortable ride. The flaring sides, characteristic of a Tolman, contribute to its seaworthiness. The boat comes up on plane very easily, carves turns nicely, and tracks well. It is perfect for sport fishing, exploring, or edging up to a beach for beachcombing or for offloading passengers and camping gear. Jumbos are easily trailered with a heavy-duty pickup, although tandem trailers are needed for the larger stretched versions with heavier cabins. The Jumbo will get 3 to 5 miles per gallon of fuel, and its range with the recommended fuel tank is over 250 miles. My Jumbo turns heads when trailering, and I’m often approached with questions about it at fuel stops and in harbors. With its good looks, fuel efficiency, and being fun to build, it’s easy to see why the Tolman designs have become so popular. Online Tolman forums have become quite popular and are helpful for discussing all parts of the building process; long-term friendships have developed through building and using these boats. If you’re looking for a boatbuilding project that will produce a great-looking and good-sized boat in a reasonable time frame, look no further than the Tolman Jumbo. Neil Andrews is an IT professional who loves adventuring in Alaska and lived there for 30 years, raising his family and building boats in his spare time. Although now residing in Arizona, he continues to explore Alaska and enjoy boating in Prince William Sound in the summer. Renn Tolman’s book, Tolman Alaskan Skiffs, is available from the WoodenBoat Store, Duckworks, and from the publisher, Kamishak. 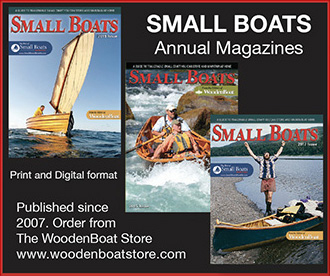 West Coast Boat Works of Bend, Oregon, provides kits for the Jumbo and the two other Tolman Skiff models. The Saltwater Workshop of Buxton, of Buxton, Maine, also provides kits for all of the Tolman Skiffs. I loved this article. I built a Tolman about 10 years ago. It was the best project I’ve ever done and the best boat I’ve ever owned. I love being a part of the Tolman community—what a great bunch of folks. Thanks for the great article on the Jumbo! I am looking for a project boat and I think I may have found it.